FYI for those of you who are interested in learning more about Eat To Live, I am selling an Eat To Live Bundle on ebay. 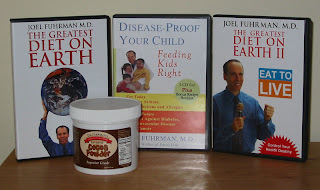 The set includes both of Dr. Fuhrman's DVDs, the 5 CD audio book "Disease-Proof Your Child", and an unused container of Dr. Fuhrman's Cocoa Powder (I bought it, then thought better of adding cocoa powder back to my diet -- too tempting!). Even after you've sat down and watched them once, these DVDs are great for putting on in the background for snippets of encouragement and inspiration as you putter around during the day. The CDs are especially great for listening to in the car with the kids. 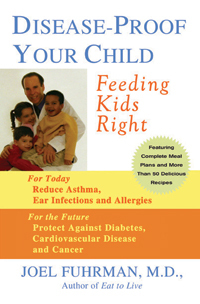 After they hear these lessons on the fabulous disease-fighting properties of a healthy, plant-based diet, you might find your kids becoming more enthusiastic about eating their vegetables! Remember the Jif Most Creative Peanut Butter Sandwich Contest? Back in February shmoo and I sampled the Texas Roll 'Em Up, and today I finally got around to making my second favorite entry: the Rocking Rainbow PB & J. Although neither of my vegan-friendly favorites won the contest, they both made Runner Up. Half a whole wheat pita is filled with (organic, all natural) peanut butter and grandma's homemade jam, and the outside is spread with more peanut butter and decorated with fruit. Two daikon butterflies are flitting about the rainbow. (Please don't ask me how I did it. I found instructions in an old library book on garnishes, and I went through an entire daikon to get these two good ones!) Baby carrots with vegan ranch dip, a small container of sesame sticks and a cup of shmoo's favorite oat milk complete the meal. Verdict: The biggest question I had about the Rocking Rainbow was, how do you pick it up and eat it without all the fruit falling all over the place? Well, shmoo solved the problem in his own simple way: he picked all the fruit off and ate it first with his fingers, then picked up the pita and ate the sandwich. The butterflies got their little wings nibbled off, and everything else was devoured. 4 stars. P.S. Speaking of pb & j, isn't it amazing what a simple peanut butter sandwich can do? Those of you who read my picnic posts last summer might remember my love for Wild Garden Hummus. It's my favorite hummus for camping, traveling, and picnics; the flavor is mild and not too garlicky for kids, it's oil-free, and best of all the jars are shelf-stable and don't need refrigeration. Yes, I've packed many a glass jar of Wild Garden for lunch on a long train or car trip. So imagine how excited I was to find out that Wild Garden now comes in single-serving "Hummus To Go" packs! Hey, no more heavy glass jars or leftovers going to waste! I plan to pack some of these with us on our outings all summer long. 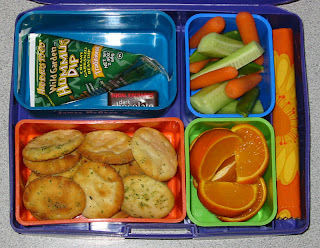 Today I packed the hummus with some Wild Garden Roasted Garlic Pita Chips, baby carrots, sugar snap peas, and cucumber, and a fresh mandarin orange cut into wedges. Next to the hummus a bite of Equal Exchange Dark Chocolate is peeking out. One of shmoo's friends was selling these fair trade chocolates and coffee as a student fundraiser. How cool is that? Most of the kids' group fundraisers I've seen have involved chemical-laden cookie dough, microwave popcorn, or cheap chocolate at a high price. It's great to discover that there are positive, vegan- and eco-friendly alternatives. 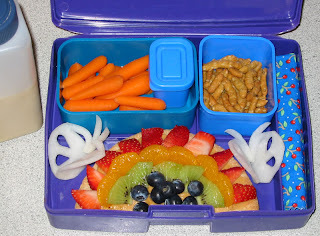 Verdict: Certainly this is one of the easiest lunches I've ever packed! Shmoo tore off a corner of the hummus pack and squeezed ribbons of hummus onto his pita chips, reminding me of the Cheez Whiz of my youth. 5 stars. Here's one of my lunches for a change, photographed in a colorful Melamine 3-Layer Tiffin from Pearl River. I actually bought the lunch box as a gift for a friend who collects melamine (shh, don't tell!) but couldn't resist posing a lunch in it before passing it on. On the upper right is a big serving of Asian Salad made with baby lettuces, cucumber, edamame, carrot, and daikon. On the upper left are some Sunny Wholegrain Sushi cones, filled with healthy whole grains, avocado slices, and sunflower sprouts. I shaped the cones using a sushi cone mold from BentoTV. 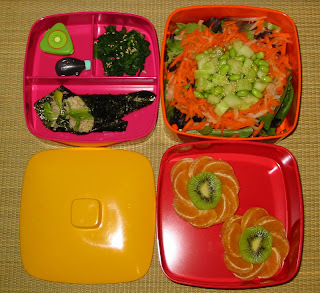 Above the cones are a pig-shaped container of homemade Ponzu Sauce for the sushi, a kiwi container of Orange Dressing for the salad, and some Japanese Spinach from Vegan Lunch Box. This recipe from my aunt is the ideal way to prepare cooked spinach for a lunch box; the spinach is barely blanched and all the liquid is squeezed out, leaving the spinach chewy and flavorful, and excellent cold. For dessert are two mandarin orange flowers with kiwi fruit centers. Verdict: In an appalling act of mealtime injustice, my husband ate both of my mandarin flowers when I wasn't looking, and had to face my righteous, mandarin-deprived wrath. 5 stars. "Mabel is thinking we might be able to modify the Allergy Alert Label. Why don't you give me the text you'd like to see on a vegan label and we'll see if we can make a prototype." How about it? Does anyone have some wording they would like to suggest? Would there be a demand in the veg*an community for a label like this for our children? Would you buy them? Some of you have criticized my comment that the "I don't eat" list should be modifiable, because individuals have different ideas about what veganism or vegetarianism means to them. For example, some vegans would add white sugar to their list, others would not, and the same is true for honey. More controversially, I know scores of "vegans" and "vegetarians" who eat eggs, fish, chicken, etc. I'm not saying this is good or bad, I'm just saying it's true in my experience. I understand that there is one set, proper definition, but in practice each family is different. I think allowing people to design their own "don't eat" list would be nice. Also, some parents might wish to add other items like "food coloring" or "wheat" to the list if their son or daughter is sensitive. Perhaps leaving off the "I am a x" and just writing "Please don't feed me:" would be the best way to go.